The LB100x LED board accommodates up to 11 LEDs. What LEDs are actually installed depends on the board version. See LB100x LED Boards for description of standard boards offered by Tibbo. The LB100x connects either to an NB10x0 board or IB100x board. The LC1000 flat cable is used for this. 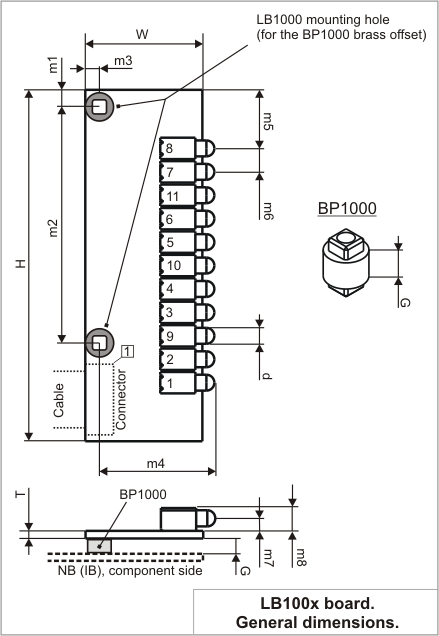 The LB100x can be mounted independently or attached to the "NB" ("IB") board. A custom-made "brass offset" part BP1000 is used for the purpose in the latter case. The BP1000 ensures precise 3.5mm gap between the LB100x and the "NB" ("IB") board. Dimensions are for reference only. Tibbo assumes no responsibility for any errors in this Manual, and does not make any commitment to update the information contained herein.